I used the public participation agenda item at Cambridgeshire’s Police and Crime Panel on the 5th of February 2014 to raise some concerns about how the panel was operating, and to make some suggestions for the future. Decisions relating to non-emergency call handling performance. Decisions relating to setting up the Commissioner’s organisation; including deciding to hold his key decision making body, his business co-ordination board, in private behind closed doors. The commissioner’s decision not to co-operate with Cambridgeshire County Council’s policing scrutiny committee. Decisions the commissioner has taken in relation to delegating local police priority setting to, in various parts of the police area: local councillors; whoever shows up to a meeting; or neighbourhood watch. Independent appointee on the panel Christine Graham was the first to respond. While the panel’s agreed rules of procedure state a supplementary question is permitted (which would allow elements of panel members’ responses to be queried) this was not afforded to me. Having reviewed the video of proceedings perhaps what happened was the chair opened a debate on if my submission ought be considered “in order”; and while no conclusion was reached on that question, in responding a number of panel members commented on the substance of what I said. Responding to my use of the public participation slot was the first substantive contribution to a panel meeting I had seen Christine Graham make. If I’ve prompted Christine Graham to take a more active role in proceedings that in itself would be achievement. Independent Panel Member Christine Graham: I think my comment, chair, would be that I agree with some of the comments that have been alluded to, that I think it is a very lengthy submission so that makes it difficult for us, in the time that we’ve had, to look at it in detail. This kind of comment is surprisingly common in local government meetings. Councillors and others often complain about having “too much information” presented to them. Too much information is the reason I’ve been given for Cambridge’s area committees no longer being presented with mapped crime data when considering new local police priorities; and I’ve seen councillors and the chair of a local police priority setting meeting argue against having any statistical evidence available to inform decision making at all. I think my submission was clear and well structured and is not a challenging document to read. I’m a bit concerned that if you’ve had these concerns for some time that you’ve waited twelve months to bring them to the panel, and actually if you had brought them in stages that would have allowed us to respond more appropriately. I number of the subjects raised in my submission were timely and relate specifically to recent events, such as the proposed council tax precept for 2014-15, the recent release of the Police and Crime Commissioner’s Diary under FOI and the release of the commissioner’s spending in his first year in office. All these points were brought to the first panel meeting after they occurred. Further items raised I brought to the panel only after carrying out other work, such as submitting FOI requests, and making submissions to other bodies including Cambridgeshire County Council and Cambridge’s Community Safety Partnership to investigate, develop and support the points made. It would have been impossible to comment on a general approach being taken by the panel (as I was doing in relation to commenting on the selection of decisions for consideration for scrutiny) until the panel had operated for a period. It would not have been possible to raise these concerns a year ago (in February 2013 the panel was holding its first routine meeting – it’s second ever – the first being a confirmation hearing for the deputy commissioner). I have attempted to contact Christine Graham directly, including on the day her appointment to the panel was announced, making suggestions about what the panel could do.
.@CGConsultancy Will you and the Cambs Police & Crime Panel look into the proposed costs of the Commissioner's office? I’ve never had any reply to any of the tweets I’ve directed at Christine Graham. I don’t expect public figures to respond to tweets, but I do think they show evidence I’ve been trying to engage prior to using the public participation slot. Christine Graham does not give any contact details alongside her entry on the list of members of the Police and Crime Panel. The panel agreed to establish a public participation slot at their 7 February 2013 meeting. That meeting made changes to a proposed “rules of procedure”; which as I understand it didn’t come into operation until after the revised version was considered at the next meeting (under the minutes item). The following meeting was the June meeting; at which there was no public participation slot on the agenda. I queried this with the panel’s officers and was told this was because it was the “annual meeting”; though I can see no exemption from the rule allowing public questions applying to the “annual meeting”. I made my submission to the third meeting of the Police and Crime Panel at which there has been a public questions slot on the agenda. I think I am only the second person ever to have managed to get a submission accepted for a public question slot at a Cambridgeshire Police and Crime Panel meeting. I think it is utterly disingenuous for Christine Graham to suggest I have not been trying hard enough to make my concerns known. I had quite a battle to get my submission accepted for the meeting in February 2014; I had to consider if it was appropriate to seek to use an agenda item the rules state is only for questions to raise concerns. I decided it was right to try, however panel member Cllr Curtis was among those who appears to think that was not appropriate. In August 2013 raised my concerns about the selection of decisions which are reported to the panel to Cambridgeshire County Council’s policing scrutiny committee, where I expected them to be raised in-front of the Police and Crime Commissioner. The Police and Crime Commissioner refused to co-operate with that scrutiny committee, but I was able to raise my concerns there in-front of Cllr Paul Bullen who also sits on the Police and Crime Panel. Cambridgeshire Police and Crime Panel meets very rarely (some panels meet two or three times more often according to evidence I heard recently being given to the Home Affairs Select Committee), so options to use the pubic participation slot are rare. I only missed two opportunities; it’s not unreasonable to expect members of the public to have other commitments. Another factor is the public question deadline comes at about the same time as meeting papers are published for panel meetings. There is a very narrow, time window, if there is one at all, where one can read the papers for a meeting and still make a submission for the public question slot in time. While one could make a submission without reading the papers this isn’t something I’d be happy doing, as the submission might have been overtaken by events by the time it is considered. I think all panel members should rightly feel uncomfortable with the tone of my submission; I’m suggesting they’ve not been doing a very good job by allowing the Police and Crime Commissioner to select which decisions get scrutinised rather than taking a more proactive role. I think this element of Christine Graham’s response is positive and I hope her discomfort might spur her on to more robustly hold the commissioner to account and to use the role which she has been appointed to. 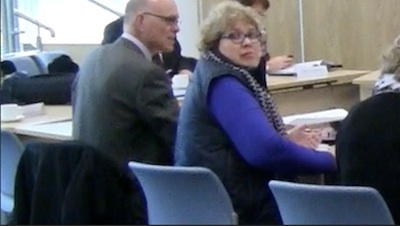 Independent Panel Member Christine Graham:but when I look in detail some of it I have researched and I have looked on the websites you have referred to and I don’t necessarily agree with the conclusion you have drawn, so when you talk about Warwickshire Police and Crime Commissioner having 139 decisions scrutinised, when I looked this morning a number of those decisions were: “The Police and Crime Commissioner had an update on such and such a project and is satisfied it is progressing satisfactorily”. Now we can sit here and talk about semantics about if Sir Graham should be bringing such things to the panel. I didn’t refer to Warwickshire Police and Crime Commissioner having 139 decisions scrutinised; what I did refer to was Gwent Police and Crime Commissioner’s decision log. I’ve reviewed that log again in light of Christine Graham’s comments and identified the one decision I think she was probably referring to: People Services Plan Half Year Update 2013; that is actually an update on a plan, seeking the commissioner’s approval for the future direction of the project. The decision notice is a scanned document which doesn’t link to the update report, so it is impossible to assess the significance of the decision. Clearly many of those decisions reported by Gwent’s commissioner are significant and worthy of at least consideration by a panel, even if they make no comment on them as the list is put before them. I provided a list of decisions, and types of decisions, which I thought Cambridgeshire’s Police and Crime Panel ought be considering for scrutiny; and approving updates on projects was not on that list. Independent Panel Member Christine Graham: I think it is splitting hairs; that said there are one or two points in here which require further scrutiny, I think it is unfortunate that possibly they have been lost in a very lengthy document. I think it would have been useful if Christine Graham had identified the “one or two points in here which require further scrutiny” and proposed the Police and Crime Panel take them on and do that work. Please consider adding an RSS feed on this website to allow readers to be alerted when you publish new entries. Thanks. I looked before but I couldn’t find those details linked anywhere.